These seven lines, a direct and punchy manifesto, are the first thing you see when you visit the website of Lost Dog, a company who since forming in 2004 look like they’re set to inspire a whole new generation of audiences, dance and theatre makers alike. The sands have long been shifting in the performance world; the limelight has swerved from script-based theatre. The audiences for the pioneers of dance from the sixties (think Cunningham and Alston) who have long held the main stage are growing tired. For the ‘now’ generation there’s an undeniable hunger for the kind of physical theatre, or dance theatre that the likes of British companies DV8 and Complicite are the fathers of. Jamie McLaren catches up with Ben Duke, co-director of the award winning company Lost Dog, before they embark upon their first Arts Council funded UK tour with their new production ‘Hungry Ghosts’, taking in the Laban Theatre (London) on Tuesday, 30th September. While I was doing a degree in Newcastle I was working as an usher at the Theatre Royal where I saw this show called Bernadetje by Alain Platel – it was amazing! I wanted to be involved with that sort of work, but felt I was too old for dancing. The work that inspired me most was being made by Ballet c de la b, DV8, Derevo, Complicite, Pina Bausch and William Forsyth. Performance that was hugely physical. I’m so attracted to the simplicity of sweating bodies on a lo-tech stage – beautifully raw. How did Lost Dog come about? I met Raquel [Meseguer, co-Director] at the London School of Contemporary Dance. At the end of our first year we made apiece together, ‘Pave Up Paradise’. The movement and text was very much us, based on our experiences and how we liked to move and also a reaction against a training that was very Cunningham based and certainly in technique terms was focused on turning us into the kind of dancers we had no interest, and no prospect, of becoming – we were never going to be employed by Richard Alston. I was really driven by my limitations as a dancer – if I can’t do other people’s material I am going to have to make up my own. I was also driven by a desire to dance as myself - dancers can hide behind their fantastic technique and not reveal anything about themselves. I am less interested in the tricks of the body, but more about the humanity of the body – and the idea that a body in space – still or moving – can give us this insight into who someone is. Darshan Singh Bhuller came to this first performance of ‘Pave Up Paradise’, he really liked it – and bought it for Phoenix Dance Company. The work was in their repertoire for the spring and autumn season that year. This really struck a chord with a lot of people and got the ball rolling for us. 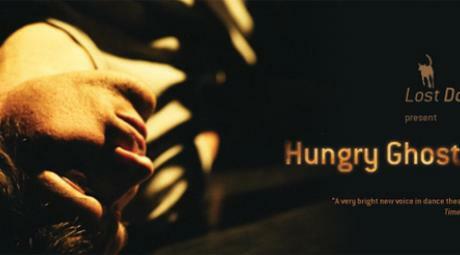 Hungry Ghosts is inspired by - but not about – the Moscow theatre siege in 2002. What was it that caught your imagination? I’ve never felt qualified to delve into the politics of it – but something did capture my imagination. I saw a documentary about it and it opened with some video footage from inside the theatre as the terrorists walked onto the stage with their balaclavas, weapons and explosives. The audience just kept relaxed as they watched what they thought was some avant-garde performance. But then they realised what was going on, this was not a show anymore, this was a group of terrorists, and this was now about life and death. Although interestingly in the end, despite having the opportunity, they didn’t detonate their bombs, people died accidentally at the hands of the rescuers rather than the terrorists. But this was just a starting point. We decided not to focus on the Chechnyan politics, but rather to reflect upon the individual experience of being involved in such a situation. We drew on our own experiences of terrorism in London and the fear it generates, but also on unrelated experiences of loss and lives cut short as a way of creating a show that was some kind of emotional response to terrorism, it’s not a documentary or a politically driven show. It explores our experience of powerlessness in the face of these seemingly random acts of terrorism and looks at the feelings of loss and guilt experienced by those who survive them. We created a show that was, when done right, moving and at times darkly funny.